Tanzania is a wonderful safari destination: Experience phenomenal wildlife and enjoy the impressive scenery at the Great Rift Valley. Your safari experience: Indulge in a luxury safari experience unlike any other at the private Singita Grumeti Reserves, enjoying a rare exclusivity of location, not found any place else in East Africa, in uniquely authentic luxury safari tents with glamorous five-star amenities. Gaze in awe as over two-million herbivores comprising of massive herds of Wildebeest, Zebra and Impala cross the Serengeti in the great annual migration in June, trailed by a stream of Africa's great predators - Lion, Leopard, Cheetah and Hyena. At the end of it all, reward yourself with an unforgettable beach retreat on the pristine islands of Seychelles – the perfect end to your Tanzania safari! Singita Grumeti Reserve is located along the Western corridor of the great Serengeti, encompassing 400,000 acres of unrivaled PRIVATE wilderness. The area forms part of the famous migratory route, traveled by millions of animals each year. Singita Grumeti as a destination in itself offers a distinctive and exceptional safari experience to top off every other in a luxurious, authentic Serengeti setting. The beautiful Singita Sasakwa Lodge, perched on Sasakwa Hill, is the crown jewel of the Singita Grumeti concession commanding spectacular panoramas of the magnificent Serengeti plains below. Singita Sasakwa lodge is a built in the colonial-style of British East African safari homes with many original atrefacts from the era of the early African pioneers. Accommodation at Singita Sasakwa comprises seven luxurious cottage suites, configured with plans of one to four bedroom suites. Each luxury cottage at Singita Sasakwa is air-conditioned and features a bedroom suite, elegant lounge, fireplace, a private deck with dramatic views, en suite bathrooms and a heated infinity pool overlooking the plains. The main lodge itself features a grand lounge, games room with snooker tables, cigar lounge, conservatory and tennis courts. Balloon safaris offer another dramatic vantage from which to break the routine of game drives and soar above the Serengeti plains. In the Migration season, a balloon safari is truly one of the greatest wilderness experiences in the World. Singita Sasakwa Lodge also offers a fine wine cellar with many South African and International vintages already pre-included in your stay, to complement the exquisite gourmet cuisine served in the various creative bush and indoor dining locations offered by the lodge. Singita Faru Faru Lodge offers six glass climate-controlled suites designed in a contemporary safari style with luxurious fittings. Wonderful views of the wilderness wrap around the lodge and suites to bring you very close to the natural sights and sounds of the Serengeti. The main lodge at Singita Faru Faru features a lounge with dining areas, elevated viewing decks, a wonderful pool overlooking the plains, and a Singita Grumeti spa. The Singita Colonial Trading Post offers a great collection of books and safari artefacts. 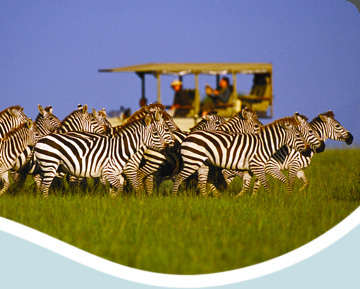 Game drives are enjoyed with the most experienced professional guides in East Africa. Safari Walks with local Maasai rangers are also offered. A unique interactive Maasai cultural village tour adds interesting background on their fascinating nomadic culture and traditions, with the option to visit their market to purchase colorful beaded jewelry and crafts designed by their maidens. The most unique choice of activities is available at Singita Grumeti with archery and mountain biking, among other options; However, the most special of these activities is the opportunity to go horse riding in the Serengeti with professional guides leading the trail – this is one of the most unique features of this luxurious safari. The Singita Grumeti Equestrian Center offers thrilling adventures into the outback for experienced riders. There is also a riding trail for those less experienced who don't wish to venture out into the plains and prefer a hand at simple riding with the fine Thoroughbreds stabled at the barn. Full tack provided. Enjoy preferential seat allocation and worldly comforts aboard the Air Seychelles Pearl Class service. Sample culinary delights from International and Seychelles Creole cuisine and private in-seat entertainment from East Africa to Seychelles.